As 2018 quickly becomes an entry in the logbook, I look forward to the New Year. For me 2019 will be a year of connection, growth and change. It is fairly easy to attend aviation events, fill up our tanks with the latest information, technology, and dream of that PC24 in our hangar. Yet it is much harder to actually roll up your sleeves and volunteer at one of these events. 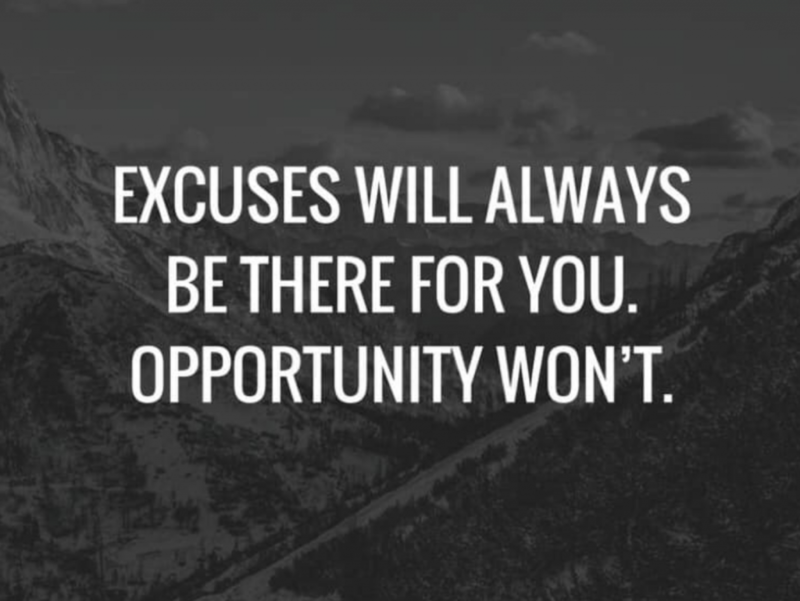 I came across this quote on the Internet and it piqued my interest. 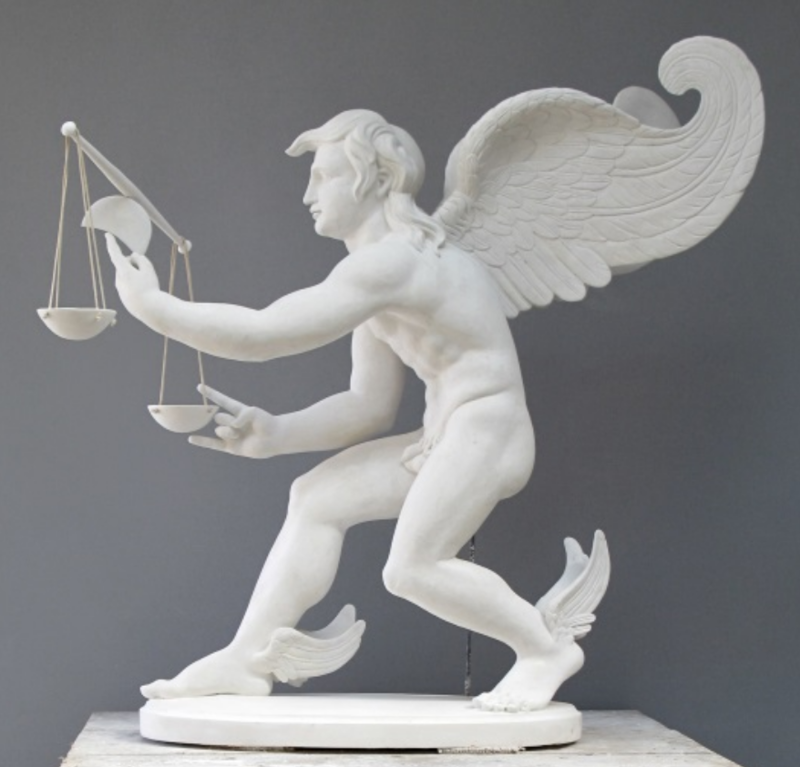 As I look back at my calendar I am very encouraged by the countless men and women who gave of themselves, who were available for opportunity to spark the wonder of flight in others. Here is a sampling of the opportunities for fun and volunteerism that I was fortunate to be a part of. Hopefully you will be inspired to take part in events in your part of the country. In February I flew in formation with a few other Mooneys to Yuma Arizona to attend the 7th annual Gunfighter’s Formation Clinic. 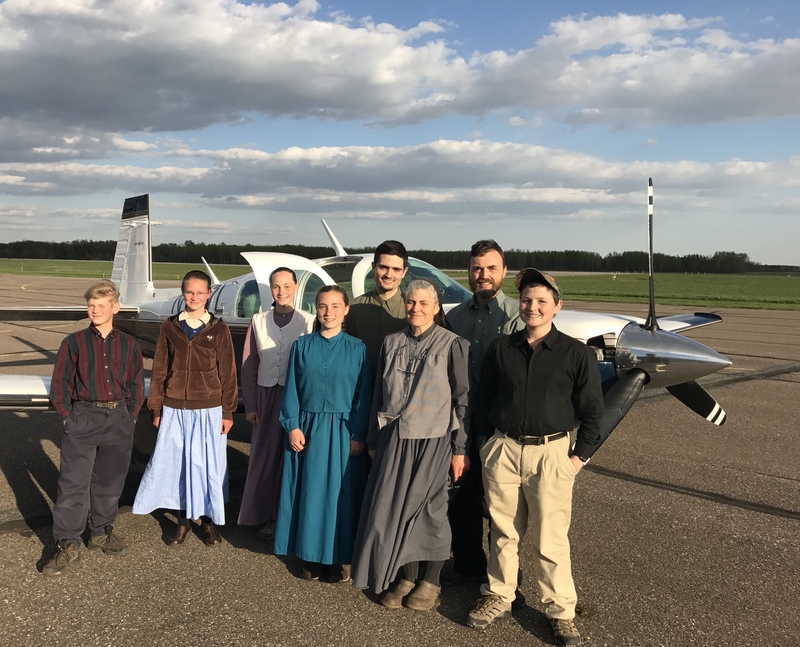 35 airplanes enjoyed the three-day event co-sponsored by the Red Star Pilots Association and the Mooney Caravan both of which are 501(c)3 non-profits. This event brings together aviators of all sorts whose goal is to gain the skill and proficiency to fly mere feet away from one another. 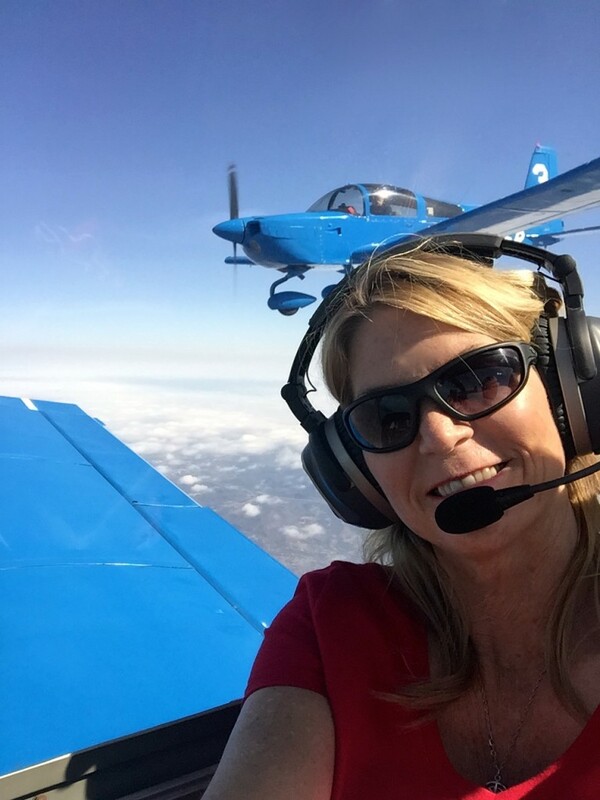 We were lucky to have my Mooney sister, Pia Bergqvist, the Executive Editor of Flying Magazine join us for the fun, and she wrote a fabulous article on the joys and challenges of formation flight. The month of April means that things are shaking in Lakeland Florida for Sun ‘n Fun. 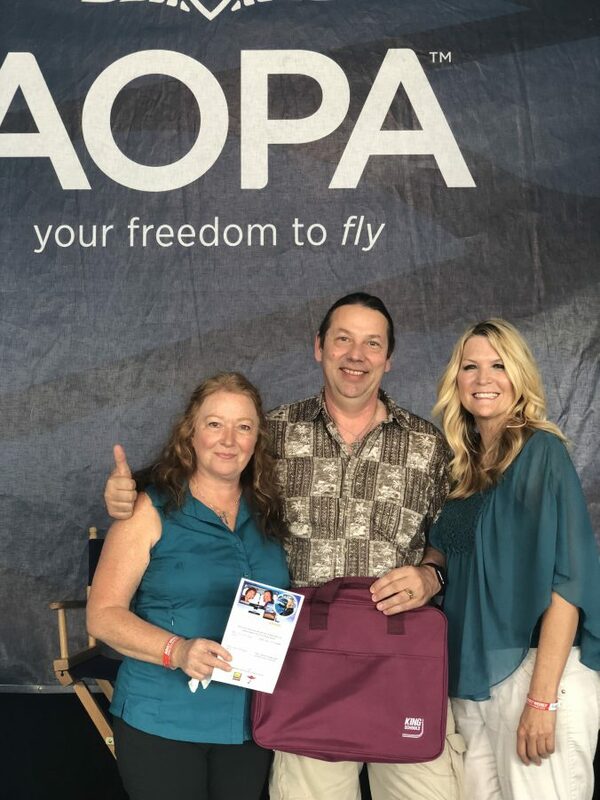 I was thrilled to be able to present Exiting the Hold: Reaching your Life Goals in the forums and for AOPA. 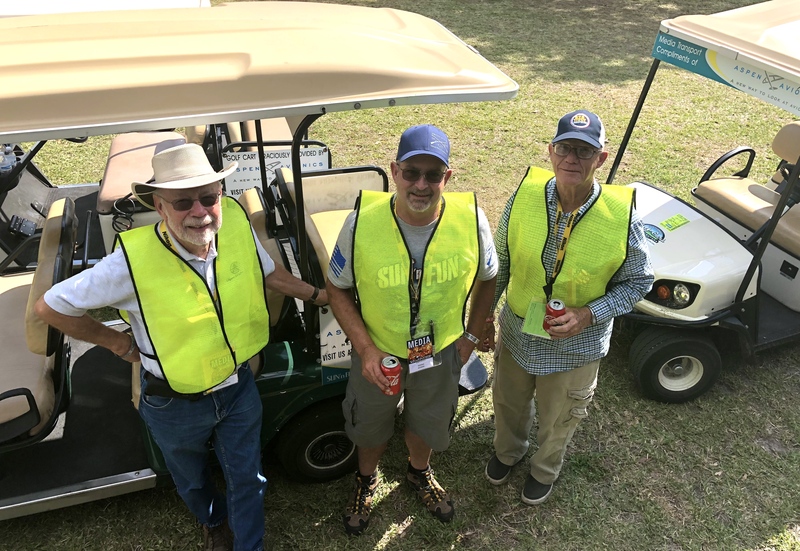 We all know the fabulous events on the schedule at Sun ‘n Fun, but as a credentialed part of the media I was able to see the inner workings of this week-long annual event. I tend to have a bunch of stuff to carry at shows. I was also lucky enough to have rides in a golf cart to and from the parking lot to the event site. It was during those rides that I got to know many of the dedicated volunteers. It can be easy to overlook the volunteers, but they really are the ones who make the events so special. 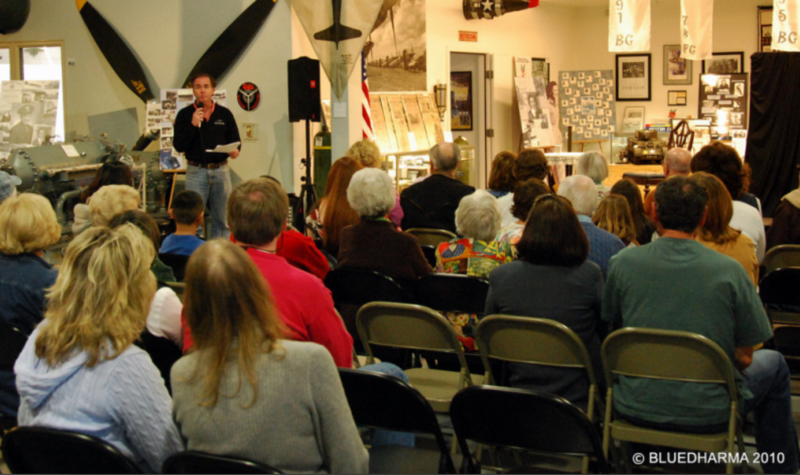 The second Saturday of May is Oceano Airport Celebration: Salute to Veterans. 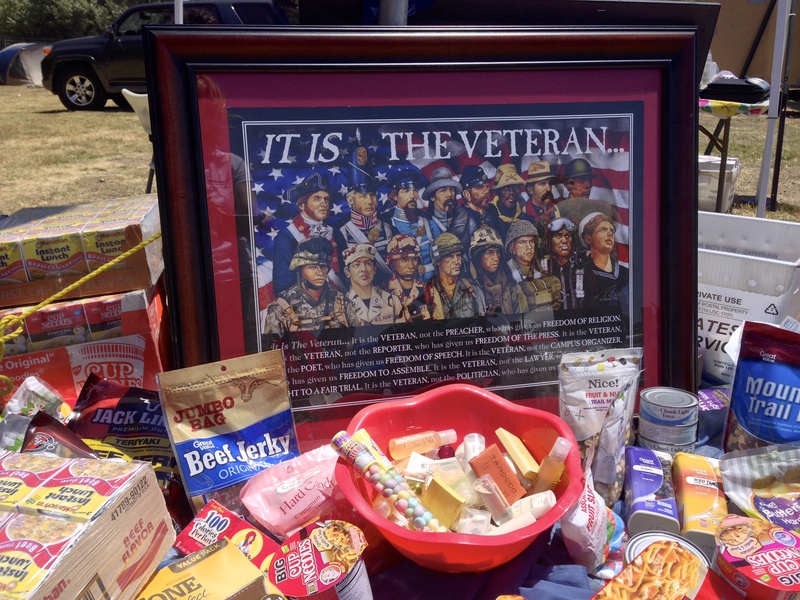 This annual event not only highlights the gratitude for those who have served our country, but as well collects needed items for military care packages. Friends of Oceano Airport [FOA] is a 501(c)3 non-profit as well as a proud member of the California Pilots Association. I am happy to serve as the President of FOA. Volunteers are the backbone of this community fly-in. Year after year we transform our campground into the event site. 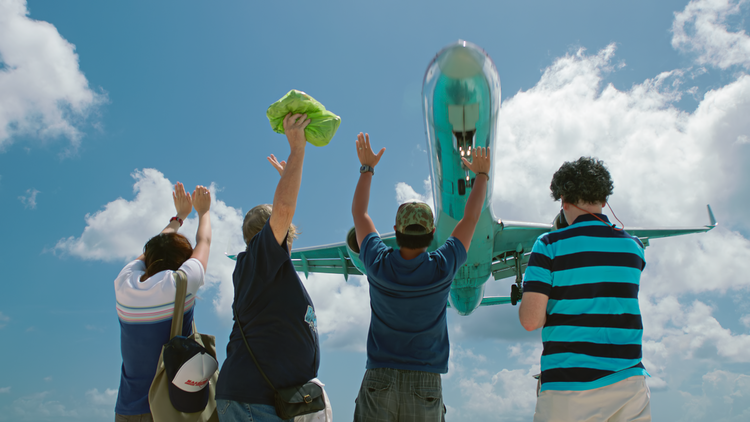 The goal is to share our beach-side airport, highlight its benefits, and inspire the love of flight to our community. 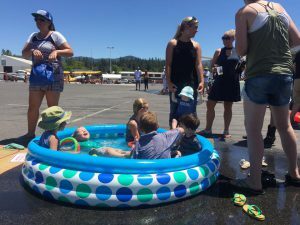 The month of June brings Father’s Day and every June for the past 52 years Columbia Airport [O22] in the gold country of California, hosts hundreds of attendees for the Father’s Day Fly-In. 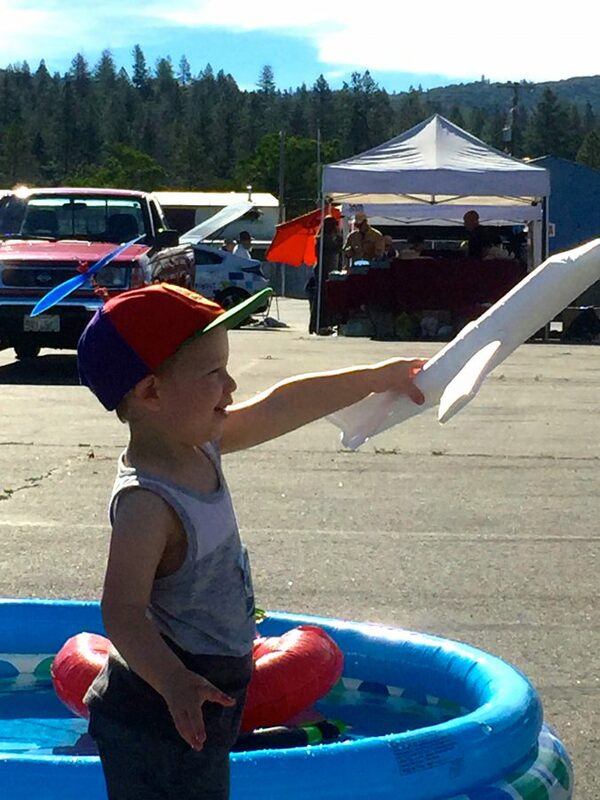 Columbia Airport has an airplane-only campground and is within walking distance of the historic downtown [state park, gold mining, pedestrian only]. I have volunteered at the fly-in for about nine years. It is so fun to see the tremendous community involvement. My Mooney Ambassador booth is popular, not only for having an awesome airplane or two on display, but also for the Moo Pool. It is not uncommon to have over 100-degree weather. Taking a dip in the pool is fun for the kids, and I have known a volunteer or two to put their feet in. It is hard to think about July without plugging in KOSH in our flight planner. This year I made the trip solo in my Mooney with a very newly overhauled engine and a fairly new IFR rating. Wittman Regional Airport becomes home away from home for over 600,000 aviation lovers and 10,000 aircraft. There are upwards of 5000 of volunteers working to ensure that the event is as fun and safe as possible. 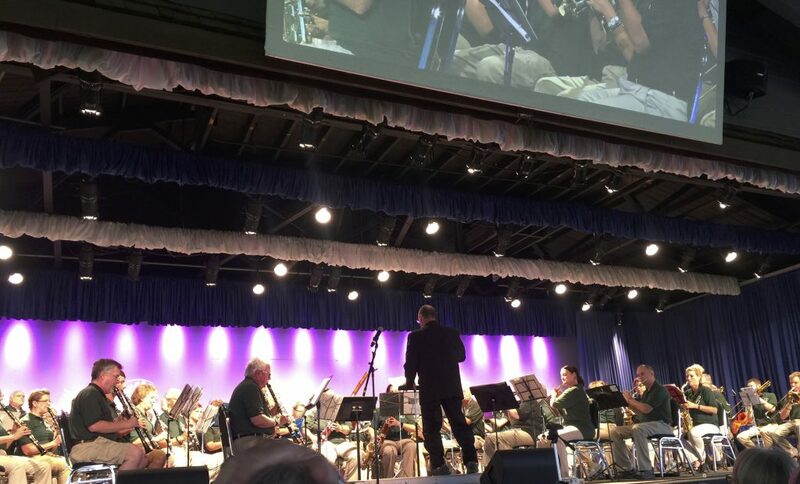 I have volunteered at OSH in a couple of capacities as a presenter but probably even more fun as a member of the EAA Airventure Concert Band for 8 years. The band is made up of members from all across the country and sometimes world, who practice our music independently over the spring and summer. 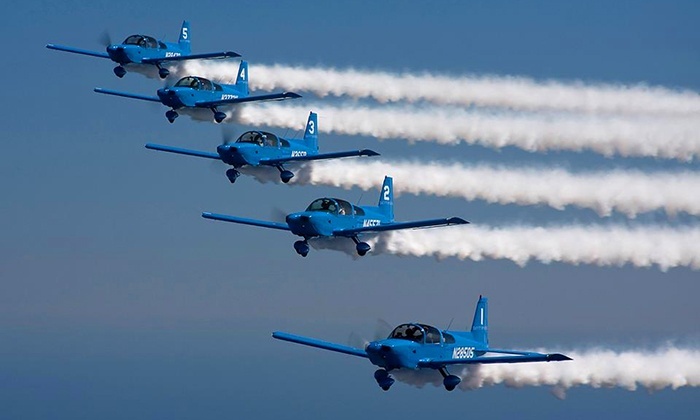 We come together and practice a few times, then perform at the airshow opener and have a concert. Elton Eisele who is also an EAA Departure Briefing Chairman directs the all-volunteer band. 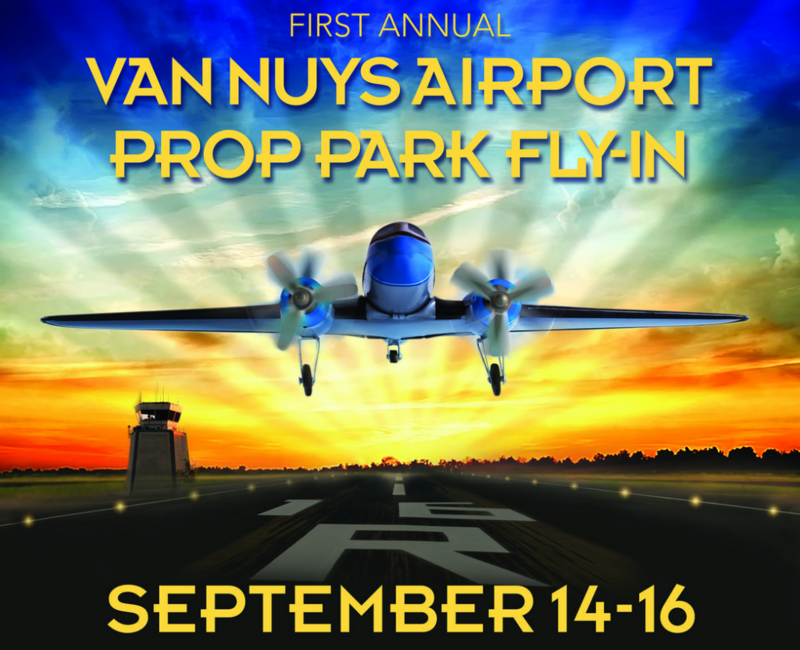 The first ever VNY Prop Park airport event was held in September. 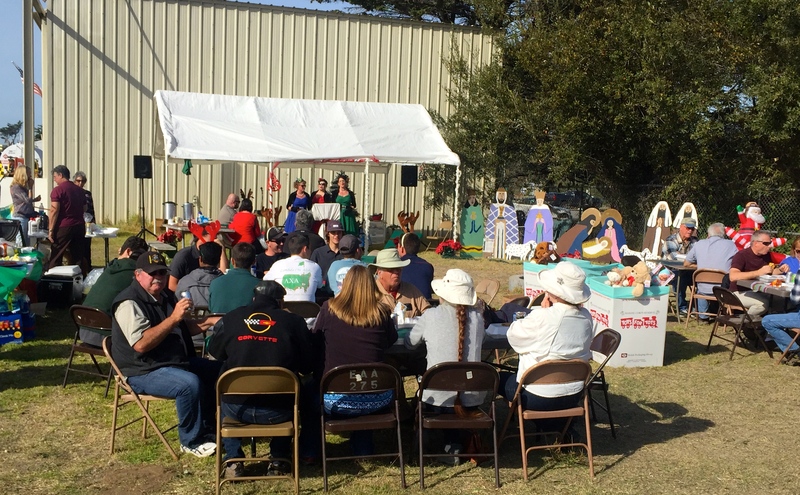 California Pilots Association also held their annual meeting at the event. 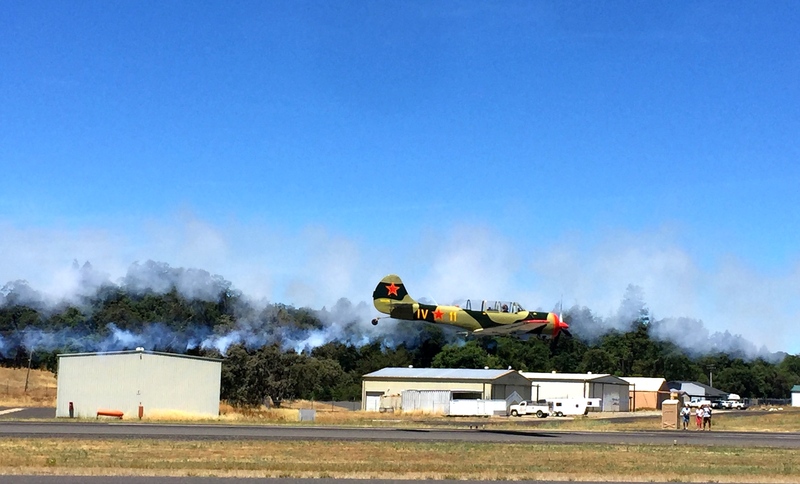 Historic 16-right provided a great backdrop for renowned speakers Rod Machado and Barry Schiff, a movie night featuring 16R and Living in the Age of Airplanes , 99s scholarship pancake breakfast and aircraft displays. The team of volunteers worked tirelessly to make the new event a success. Later in September I was happy to be able to present Exiting the Hold at the California Capital Airshow. 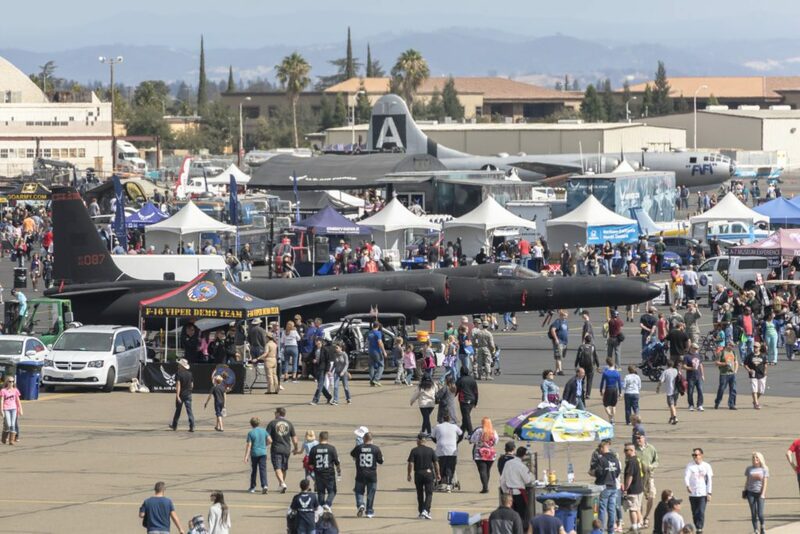 Established in 2004, the California Capital Airshow 501(c)3 plans and operates the exciting, family-friendly annual event designed to honor the Sacramento region’s rich aviation heritage and veterans while using the power and magic of flight to inspire young people. CCA gives back to the community through scholarships charitable group donations and exciting educational youth programming throughout the year. The steering committee of the airshow works to involve the military GA, and Sacramento communities. The schedule offers something for everyone. There was a night airshow, a dance under the stars; educational forums and the daytime show featured the Blue Angels. In October the inaugural Central Coast AirFest took place in Santa Maria, CA featuring the Canadian Snow Birds. This event was willed into existence by a dedicated group of volunteers. There was a tremendous amount of community integration and involvement in the two-day event. The first Saturday in December is always a busy one for us at Oceano Airport. For the past ten years we have held a Toys for Tots event in cooperation with the US Marine Corp Reserves. The satisfaction of knowing that the children in our local area are receiving gifts underneath the tree is fantastic. In addition to toy collection we also had a burger fry that supported our local San Luis Obispo 99s scholarship fund. The first event for my 2019 calendar is an evening at ACI Jet Center in San Luis Obispo, CA. 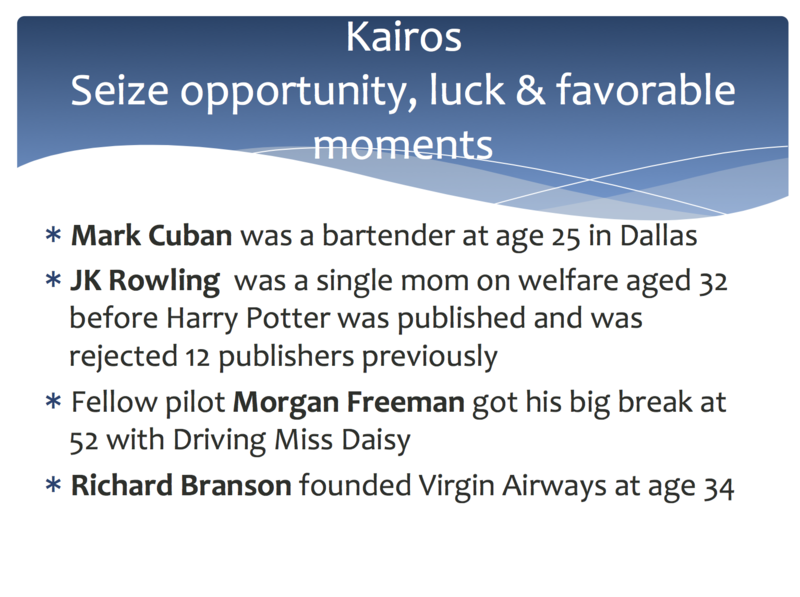 I am working with King Schools to present Exiting the Hold: Reaching your Life Goals. We will gather on Thursday February 21st at ACI. Come enjoy this free community event with FAAST team credit, refreshments, as well as cool door prizes. The face-paced multimedia presentation will help you learn the six elements for getting unstuck in life and reaching your goals. As you look toward 2019 I will give you some advice; get involved. Spark the wonder of flight in your community. Volunteer your talents in local, regional or national events. I guarantee two things; you will be tired, and it will be a happy-tired. See you in San Luis. Last Chance to Dance: camaraderie, education and inspiration during the close of the flying season. With fall leaves changing and winter weather approaching; many of us are getting our last fly-ins of the season in the flight planner. Though I live at the beach in California, not everyone gets to enjoy about 11 months of VMC. Why not check out remaining fly-ins in your area, and get in on the end-of-the-year fun? Need help finding an event or have an event to post? 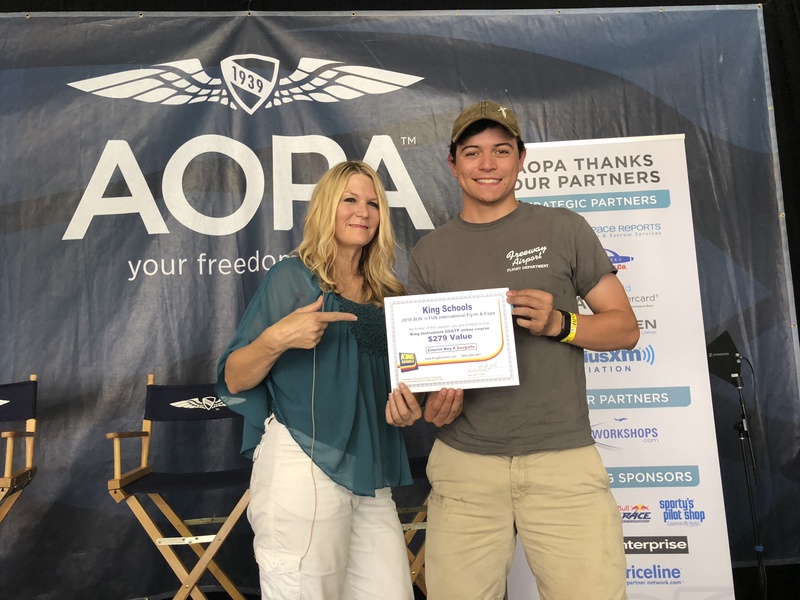 Check out the calendar on the AOPA Events page. I hope to see many of you in Florida at the end of this week. 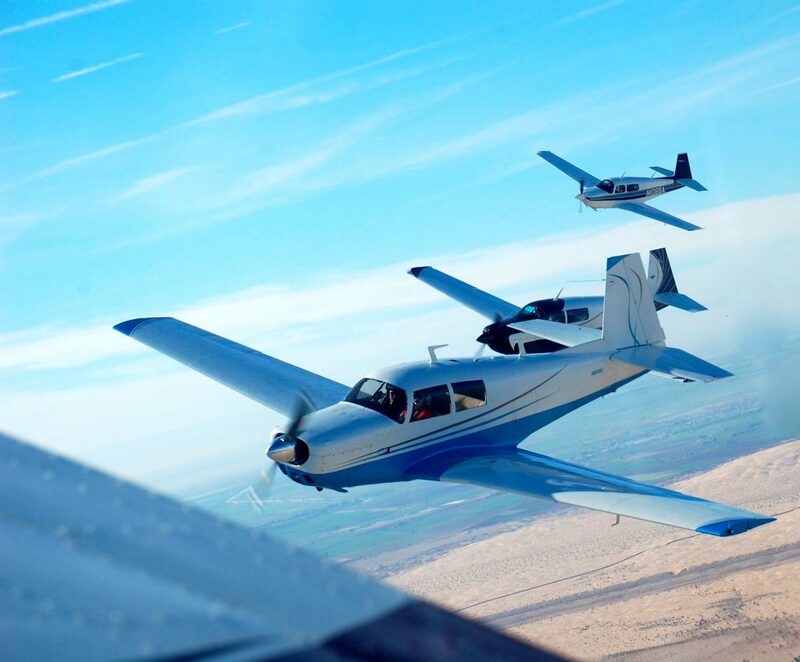 Coppertstate Fly-In Aviation and Education Expo, Falcon-Field, Mesa AZ (KFFZ) October 27-28. Come and meet fellow aviators and attend a variety of workshops and forums. Weather toward the end of October is typically clear, sunny with highs in the mid to upper 80s. Lows in the 60s. 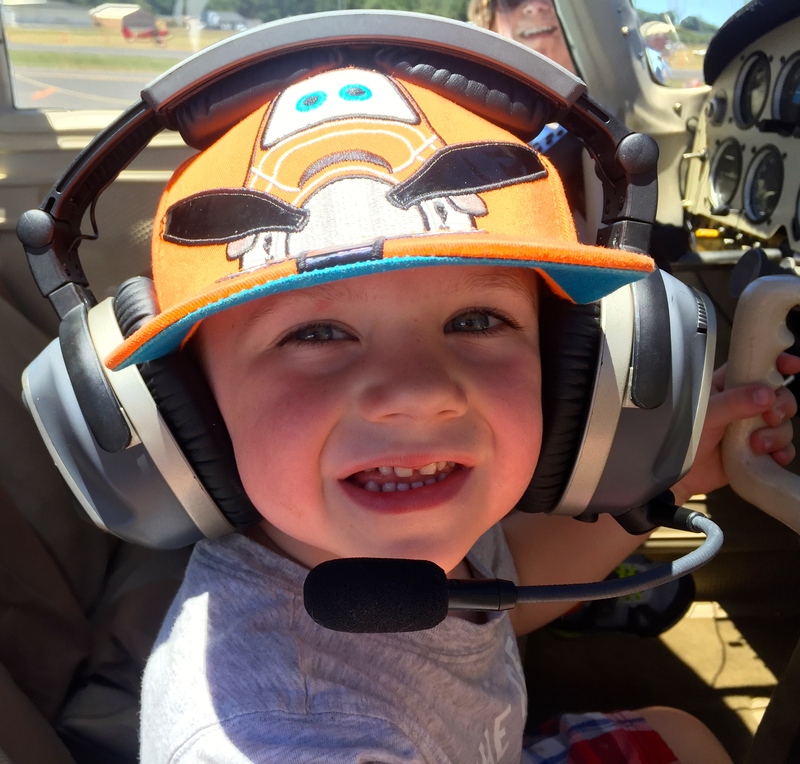 Bring your family for a great aviation outing! For more information visit event site. AOPA Regional Fly-In, Tampa, FL [KTPF] October 27-28. 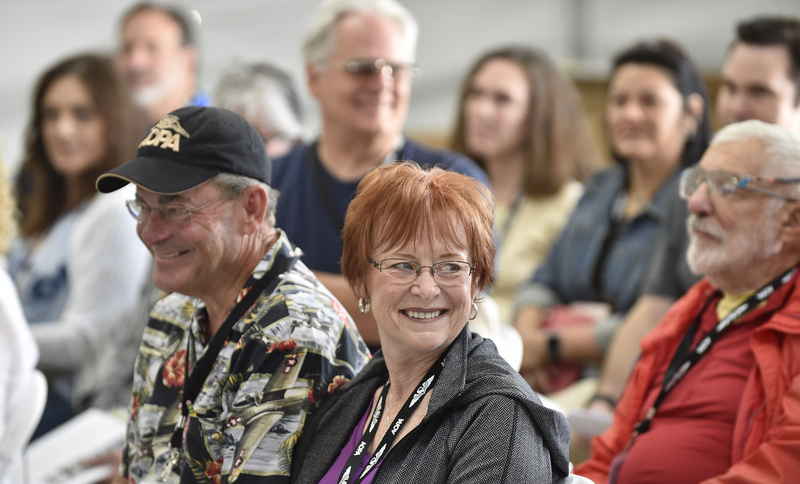 The AOPA Fly-In season wraps up at Peter O. Knight Airport (KTPF), Friday Workshops led by world-renowned presenters were very popular with attendees. Topics include: Flying in the Extremes: Water Survival Tips and Techniques, IFR Refresher: Getting Back to Instrument Proficiency, Pilot Plus One: Combining Learning, Inspiration, and Adventure, and Owner-Guided Maintenance: Managing Your Aircraft Maintenance. The fun continues at the ever-popular Barnstormers Party, presented by Jeppeson. 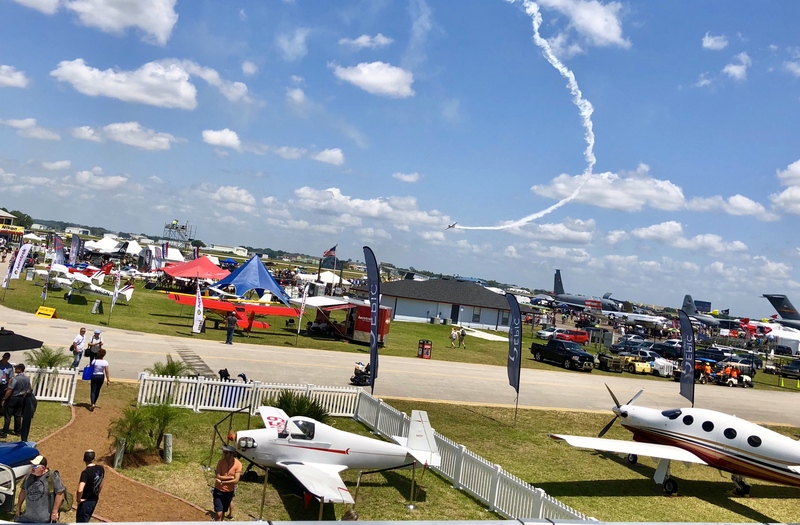 Saturday activities included free seminars all day, dozens of exhibits and aircraft on display, great meals, and a Pilot Town Hall with AOPA President and CEO Mark Baker. Event Info and Registration. Challenge Air for Kids and Friends, November 4, 9 am-4 pm at Ambassador Jet Center at Dallas Executive Airport [KRBD]. 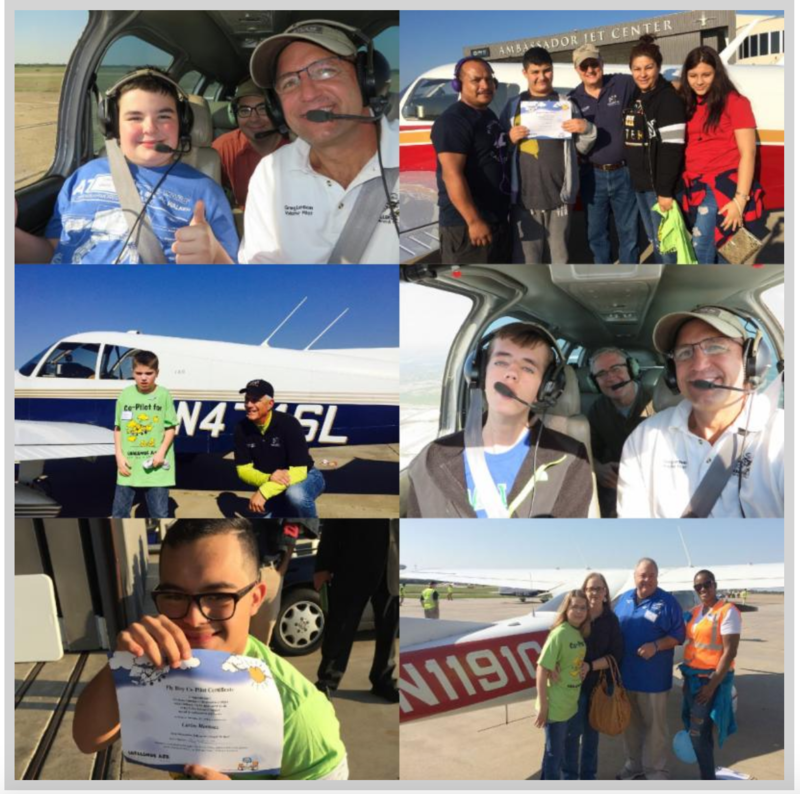 Pilots volunteer their planes to fly children with special needs on a 25-minute flight to build confidence and self-esteem. 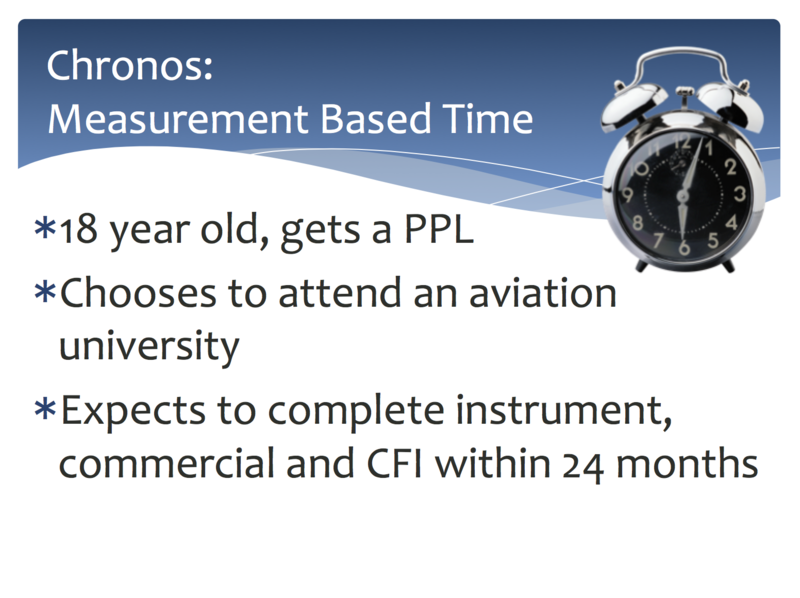 Pilots must have 500 PIC hours, current Medical and FAA license, and insurance for $1,000,000. Challenge Air for Kids and Friends has been around since 1993 and been doing this event in Dallas for many years. Please join us on Pilots, Volunteers, Families, and Agencies all need to register here on their website. We look forward to seeing you there! 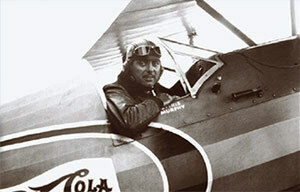 Spirit of Flight Living Aviation History Day, November 11, 10am-2pm Spirit of Flight Center Erie, CO [KEIK] Educational program about our aviation heroes and Salute to Veterans. Annual museum canned food drive for community food bank. Bring a food item and receive a FREE Starbuck’s coffee. For more information. 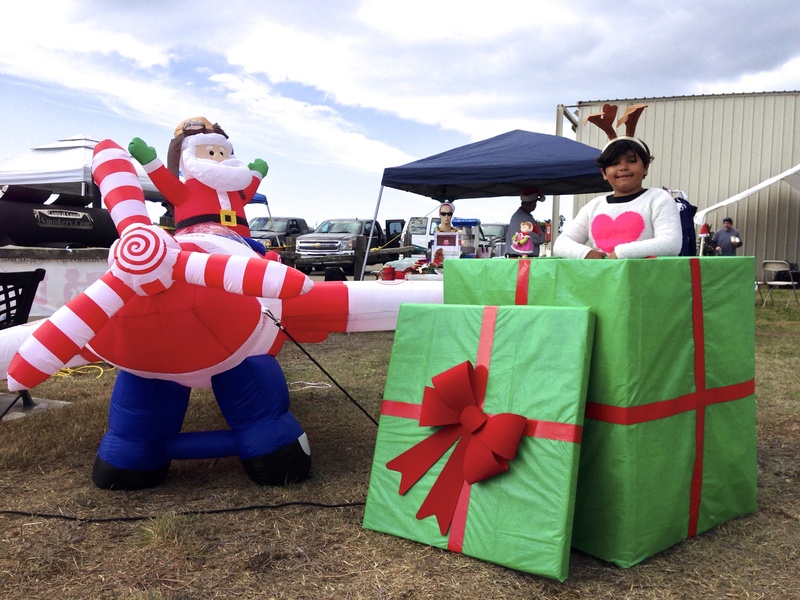 Friends of Oceano Airport Toys for Tots, December 2nd, 10 am-2 pm. 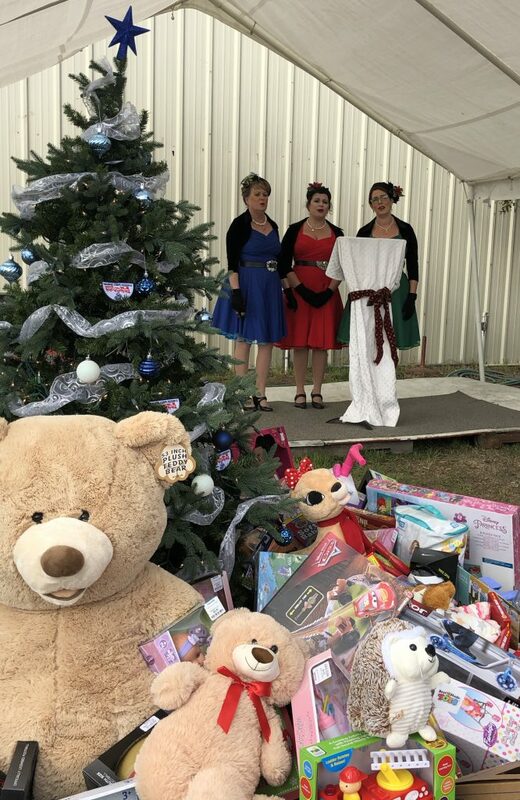 Oceano Airport [L52] Join us for our annual Toys for Tots event in cooperation with the US Marine Corps. 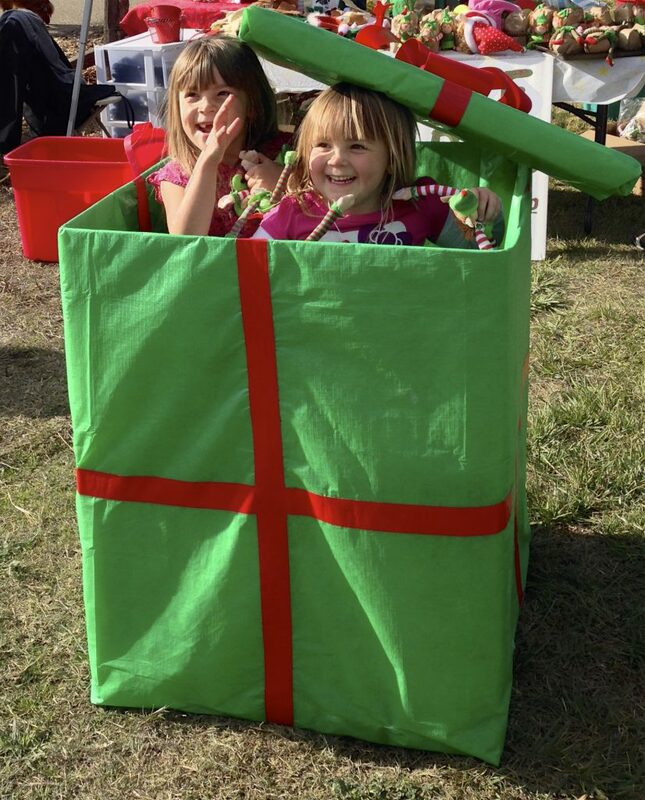 Bring a new, unwrapped toy and enjoy the fun. 10:00 Arrivals and holiday beverages 11:00 Live holiday music: the Jingle Bells 12:00 Burger Fry 1:00 Reindeer Games There is no admission charge. Aircraft on display, historical exemption sign-offs. Banner Airways: Take a ride back in history in the 1943 Super Stearman Yellow Bi-plane. SkyDive Pismo Beach is on hand for those wishing to skydive with a view of the Pacific Ocean. Oceano Fuel Discount $.25 per gallon, plus $.25 per gallon donation to Toys for Tots. Lodging Discount: Pacific Plaza Resort L52 Oceano Airport, Oceano California. Make a child smile at Christmas. Nestled in the foothills of the Sierra Mountains in California is Columbia Airport [O22]. I am just back from attending the 51st annual Father’s Day Fly-In. 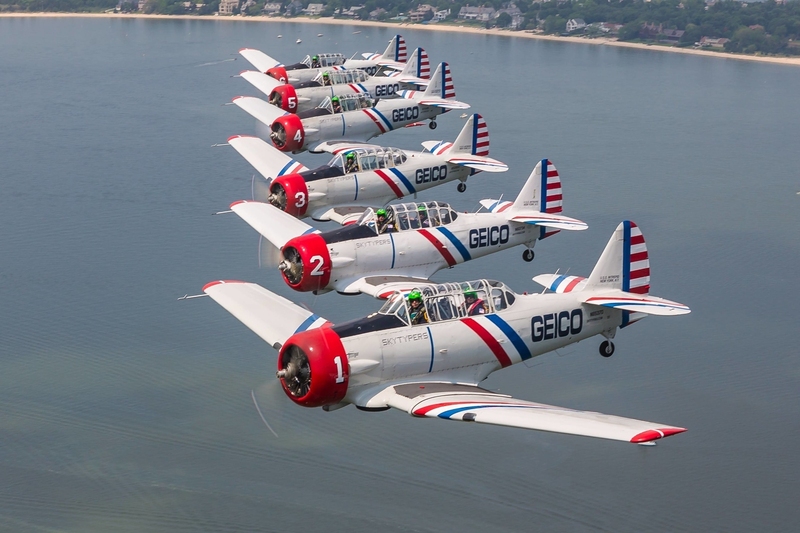 This two-day event is really a model of community involvement, fun interactive aviation activities, aircraft displays, and opportunities to fly in historic airplanes. I have had a Mooney Ambassador display and volunteered at the fly-in for many many years. Columbia is one of the few “camping” trips I go on. They have a fly-in campground that has lovely hot showers and power! But more than that is the welcoming down-home feeling of this little gem of an airport. I am always amazed at the turnout of young and old at the event. Here is a rundown on the half-century event; maybe it will spark an idea for your home base or local fly-in. The weekend started with the Friday night Volunteer Engine Company dinner supporting the local fire department. Both Saturday and Sunday mornings began with the Boy Scout Troop Pancake Breakfast in the campground. On the ramp were a variety of vendors and displays. The afternoon both days featured aerial demonstrations that thrilled the audience. The Tiger Squadron started the airshow with a formation fly-over at the end of the singing of the national anthem. Nine members flew military airplanes including the Chinese Nanchang CJ-6A, Russian Yak 52, Yak 50, and the Yak 18T. The Baybombers mass formation military display team delighted us with precision, speed, and sound: A shiny Beech 18 was hopping rides and provided some fly-bys. There’s nothing like the sound of radial engine to get your attention. During the heat of the day, we were treated to several drag races featuring muscle cars. There were several Airplane vs. Car Races, but my favorite was the Stearman vs. Model A “Race.” Two pieces of history battling it out for top honors. My Moo Pool was a hit again this year. Probably the best $10 I have spent a few years ago was a kiddie swimming pool. It became a gathering place to cool down and we had a birds-eye view of the airshow. Later in the day on Saturday, we were treated to watching pilots test their skills with the Flour Bombing & Spot Landing Contest. A slice of history, Executive Sweet [B25J] attended, offering rides to those who wanted to go back in time. 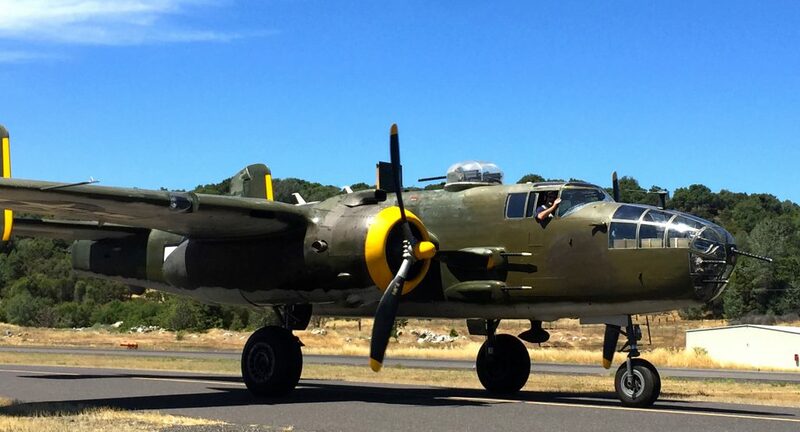 The American Aeronautical Foundation located in Camarillo, CA, owns the B25 Mitchell Bomber. They are a 501c3 non-profit dedicated to helping preserve the aviation legacy of World War II Veterans and the aircraft they flew. I actually met a couple of the crew when they were admiring my airplane and the shiny paint job. I mentioned that I have a small oil leak that was making me crazy. One of the pilots, Alex Nurse, said if I wanted to see oil to come over to the B25. I took him up on the offer and got a tour of the mighty airplane. Looking up at the airplane I was just mesmerized by the history it has seen. Standing under the bomb bay doors was sort of eerie; it was almost like I could feel the hopes and dreams of the men who flew her oh so many years ago. Climbing in to the cockpit was quite a feat and really gave me an appreciation for the airmen who scrambled around in challenging flying conditions. 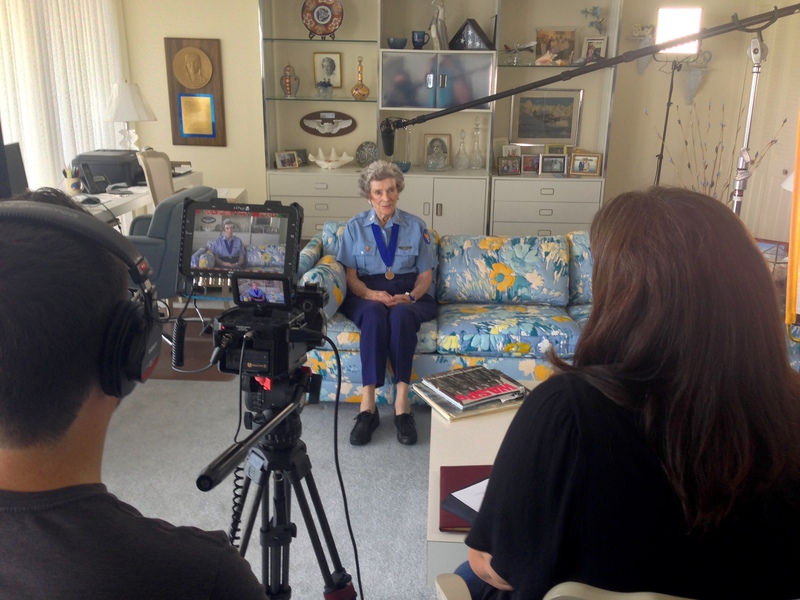 Alex described his passion for the AAF and his commitment, as a volunteer pilot, to sharing the history of Executive Sweet with the community. He talked about getting older veterans in the airplane [some who even flew in a B25] who walk slowly to the B25 and how once in the plane they are able to move around nimbly and their eyes light up. 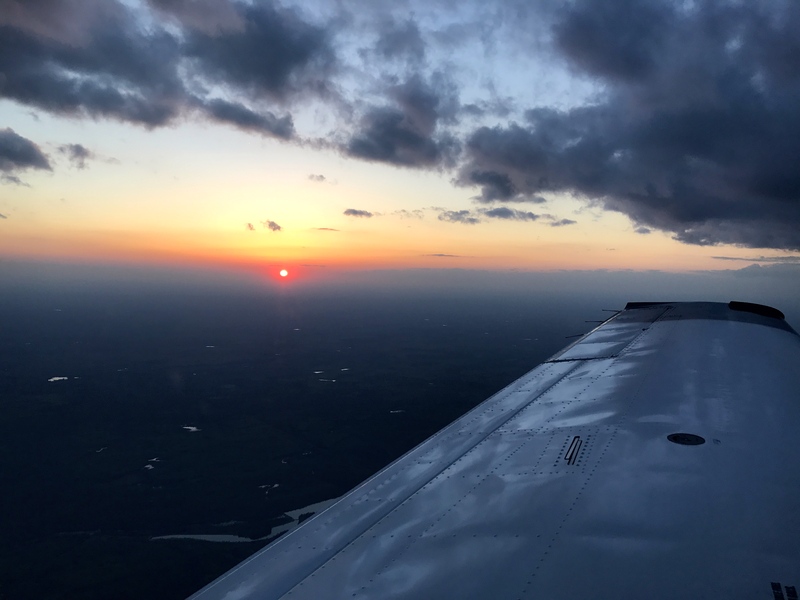 I wanted to focus this month’s column on how with small moves, we can connect and inspire through our love for General Aviation. I would like you to meet Tom Sullivan a soft spoken and self-effacing pilot, volunteer and business owner. Through history, an unexpected medical emergency, and dedication, Tom gave some Wisconsin kids the thrill of a lifetime. 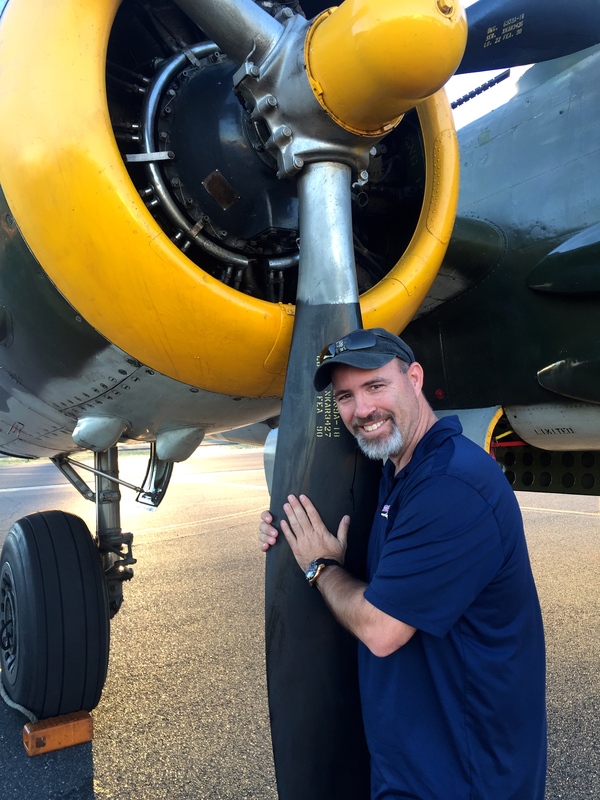 If that weren’t enough, he is the local chapter President of EAA 439, Iron Mountain. They are currently planning their 16th annual Ford Airport Day, September 16th, 2017. This year will feature rides in the Ford Tri-Motor. The Friday before airport day, they join forces with a local a POW/MIA ceremony. They have music and all veterans come to have a free lunch, last year serving 500 veterans. Way back in 1998, Tom bought Lancair kit. In 1999, he drove with a buddy from Michigan, to the Lancair factory located in Redmond Oregon for a fast-build training. On the drive back [non-stop 35 hours], he developed health problems. His arm started to swell up developed a blood clot in his shoulder. He was whisked away to Greenbay for tests and a procedure to open clot up. The procedure didn’t work so he received a blood transfusion and life-saving surgery. 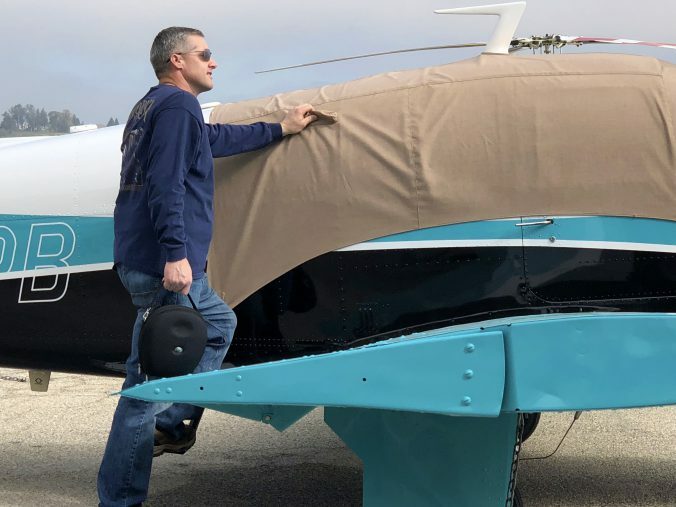 According to Tom, this brush with death lead him to “focus on family not things.” He put off the Lancair kit until February 1999 and worked on it about 200 hours per year. Once his kids went off to college in 2012 and he started working more on the airplane. At present, he has about 100 flight hours on the plane. A few weeks ago, Tom needed some machining done on his Lancair’s AC system. He was given name of Mennonite man who could do the work in Medford Wisconsin, near Athens. As the two men got to know each other, the man developed a keen interest in the airplane. Apparently, he shared his interest with his children who were fascinated by airplane. The children had ever seen a small plane. Tom offered to give the kids a ride in his Mooney when he came to pick up the parts. When the parts were done, Tom flew the Mooney 35-minutes in to Athens, Wisconsin. As he taxied up, he saw quite a welcoming committee waiting for him. The kids and grown-ups were all on ramp with big happy smiles on their faces. Tom did a five-minute ground school/walk around the plane. He took oldest boy and two younger girls first on the 20-minute flight. He was surprised that older boy had researched flying online and was very interested in the aircraft systems. Tom even let him fly plane for a while. Tom says that at the end of the time with the families, it “felt like such an emotional experience. We are all advocates of GA. It was humbling, and they were so appreciative.” A humbling and rewarding experience, what a lovely way to look at sharing our passion. “Sharing with people reminds us how fortunate we are” Tom reflects. His experience is a gentle reminder how special GA is, how lucky we are to be able to fly. As Tom and I talked we touched upon the fact that flying has a deeply spiritual component. 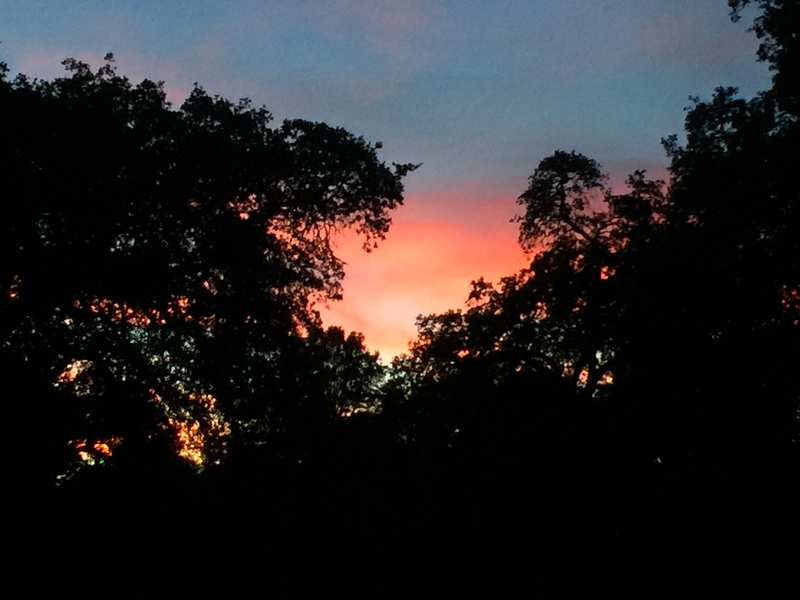 As he flew home with the setting sun to his left wing, he felt connected to his passion, family and new friends. Last week I attended my first Sun n Fun convention in Lakeland Florida. I have annually attended Oshkosh AirVenture for the past decade, but had not yet made it to Florida. Although I had work duties with AOPA and Mooney, I also was keenly aware that my deadline for this column would fall within my time at Sun n Fun. Attending the media briefing on Wednesday April 5th, I was intrigued to hear Katie McEntire Wiatt speak about her documentary project Fly Like a Girl. Later that day I was in the SNF announcer’s stand waiting for my interview. I saw a gentleman sporting a Fly Like a Girl shirt headed down the stairs. I quickly exclaimed, “Fly Like a Girl man, can I talk to you?” Come to find out the man I shouted to was the film’s producer Andy McEntire. We exchanged information and set up an interview with Katie later that day. Katie and her crew met me at the Mooney Pavilion and we quickly started talking about this important and thoughtful documentary. According to Katie, “Fly Like a Girl explores the courageous history of women in aviation which reveals the contributions women have made to aviation and brings to light the many women who are doing extraordinary work in aviation and STEM today.” Fly Like a Girl also examines why many young girls don’t see themselves in STEM related fields and how society can begin to change this perception. Katie is a former elementary teacher. It was during her time as a primary school teacher that she first developed the idea for Fly Like a Girl. She saw first hand the gap in confidence young female students felt in the classroom, especially in relation to STEM subjects. “I remember one student in particular, she was struggling with a math problem. She said,“Ms. Wiatt, girls just aren’t good at math. 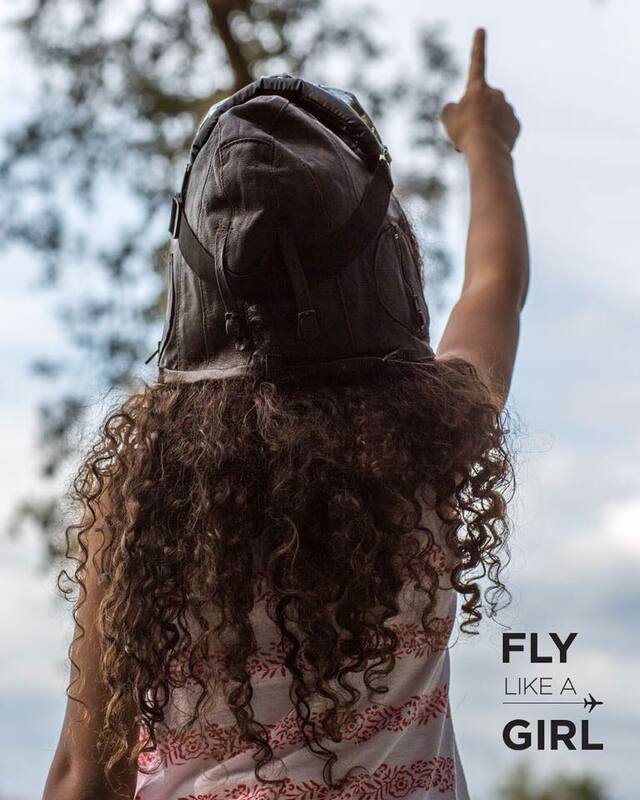 The hope is that Fly Like a Girl will inspire girls and women who no longer want to be passengers.” Katie mentioned a recent study in Science Magazine found that young girls are less likely to think their own gender is smart. In order to change this narrative, it is crucial that girls and women see people like themselves, achieving great things in their fields. Three interviews have been completed and more are being scheduled for the remainder of 2017. What I experienced at Sun n Fun is an example of how aviation folks are the best folks. I never met a stranger, always greeted with a smile and a helping hand. We had every season weather-wise from 94 degrees to rain and wind. Through it all, I saw dear old friends, made some new ones, and found inspiration in projects like Fly Like a Girl. Count me in for #SNF18. Last weekend I flew from Santa Maria, CA to Prescott, AZ for the final AOPA Regional fly-in of 2016. 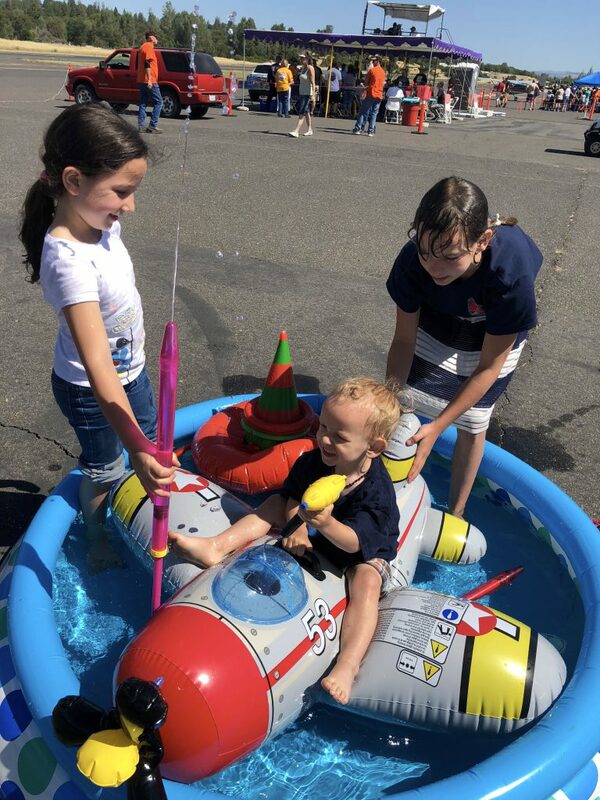 Through my service club, the Mooney Ambassadors, I am able to display an airplane, and have a booth with children’s activities etc. There were over 6000 attendees at the event and I had the opportunity to meet pilots, wanna be pilots, and families of each. One of the folks standing by my airplane was Gillian Blumer. I asked if she would like to come inside my Mooney and we had a nice chat. Gillian, from Corvalis Oregon, is a freshman at Embry-Riddle Aeronautical University. She developed the passion for flight in a 7th grade science class when they had a mechanics of flight lecture. 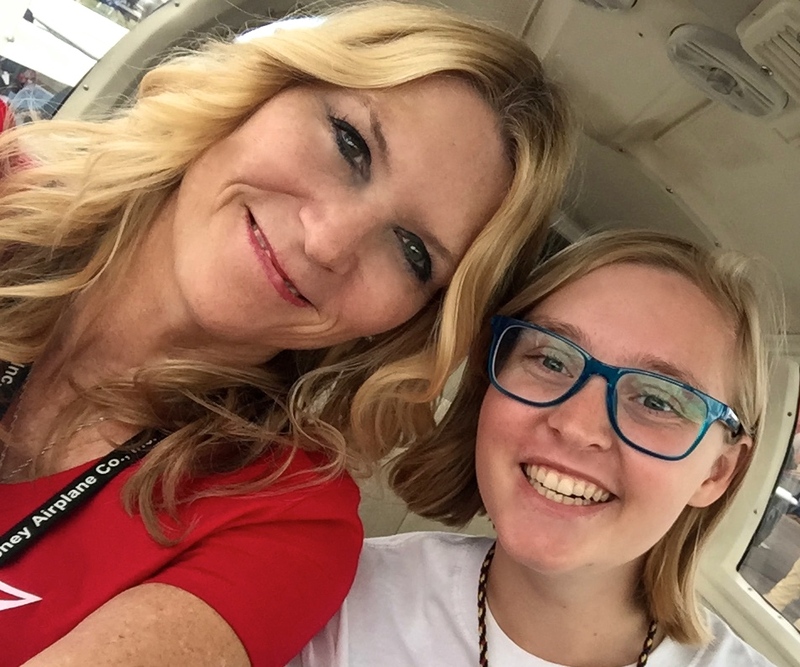 Gillian is working on her pilot’s license, and she has a passion for aeronautical engineering. If all goes according to plan, she will graduate with an aeronautical engineering degree with a minor in computer science. When I asked her what she wants to do with her engineering degree, I was completely impressed with her answer. 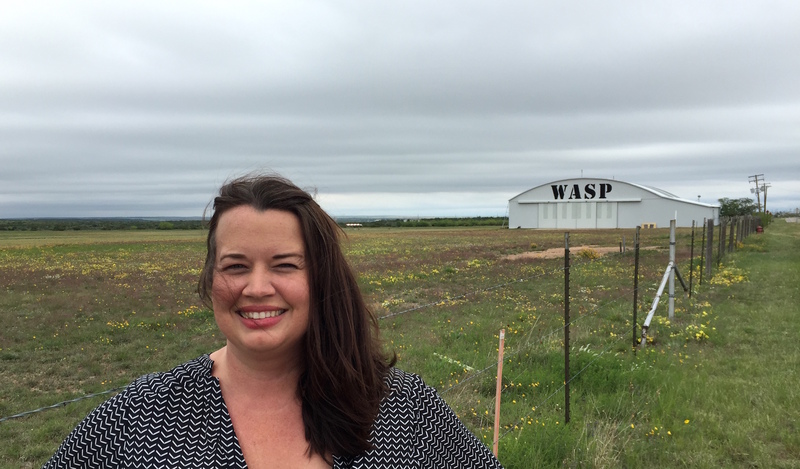 “I want to incorporate aviation into society. A lot of people see airplanes as transportation for long distances or goods and materials. But I believe with future technology, we can create airplanes for every day life, that can get us from point A to point B in wonderful fun. These airplanes have to fit key aspects: be relatively small [size of car] and able to take off in short fields or through vertical lift. Currently vertical lift airplanes are not efficient because the propulsion it takes is inefficient. I would like to work on making vertical lift planes more efficient. I feel that we could do a lot to advance aviation if we re-designed aircraft engines. I have applied for the Human-Powered Project on campus, which seeks to design a human powered aircraft,” she says. 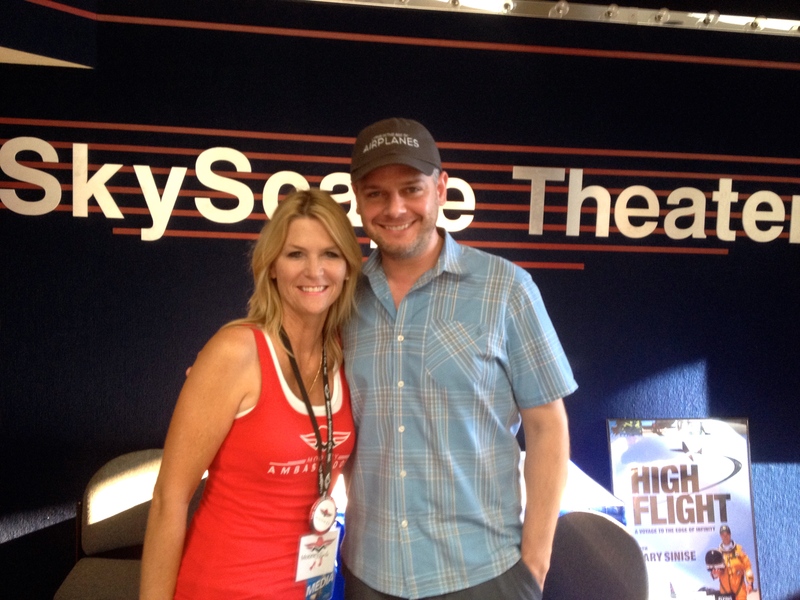 Her comments about bringing the fun and wonder back to aviation made me think about my friend Brian Terwilliger and his movie Living in the Age of Airplanes. Following its premiere at the Smithsonian National Air & Space Museum in Washington, DC, the film continued its successful run on giant screen, digital, IMAX® and museum cinemas worldwide in 2015 and 2016. I was lucky enough to see a press screening in Oshkosh and it is set for a Blu-Ray/DVD release October 25th. The movie is simply stunning. 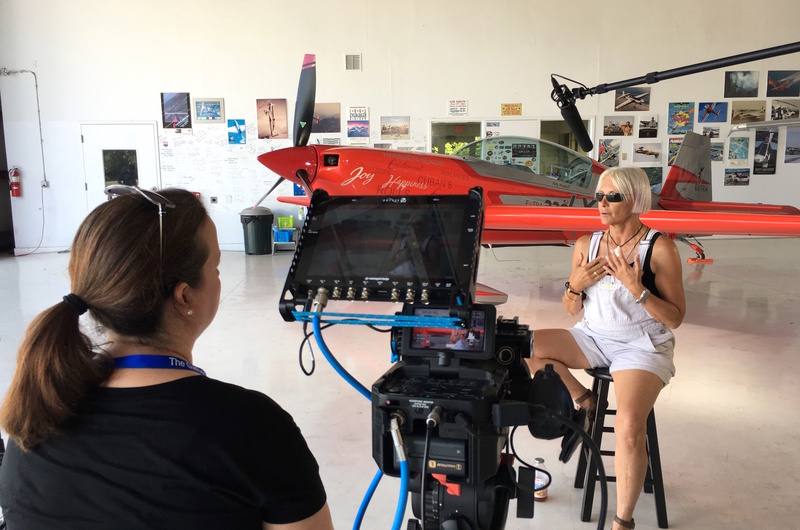 As many of you know Brian was the filmmaker who brought us the aviation classic, One Six Right about historic Van Nuys airport. 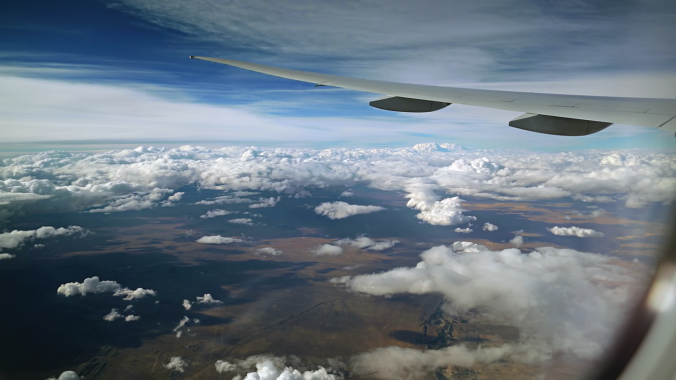 To dramatize the remarkably fluid global traffic enabled by contemporary air travel, Terwilliger traveled with his crew to 95 locations in 18 countries searching for some of the most exotic spots on earth. 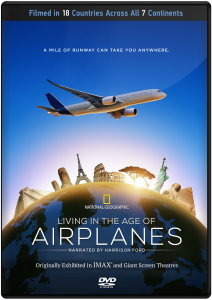 Living in the Age of Airplanes is directed by Brian J. Terwilliger (One Six Right) and produced by Terwilliger and Bryan H. Carroll. Director of Photography is Andrew Waruszewski. Music is by James Horner (Avatar, Titanic) and the Editor is Brad Besser. To create the music for Living in the Age of Airplanes Terwilliger collaborated with another private pilot and kindred spirit, composer James Horner, who scored such Hollywood blockbusters as Avatar, Titanic, and Braveheart. Take a listen to the beautiful SCORE . We all need to continue to think outside the box. Young people like Gillian will push aviation forward through design and engineering. Creative visionaries like Brian Terwilliger will illustrate the awesome wonder of our world and the ability to live life in three dimensions. What will be your contribution? 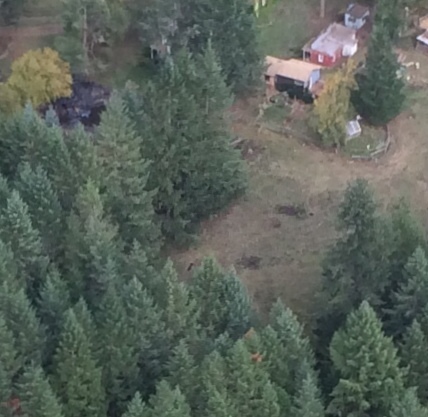 What does a falling tree look like from the air? Jean Moule last wrote for the Flight Training blog about flying in Hawaii. She is an emerita faculty member of Oregon State University, and a published writer and artist. Visit her website.—Ed. Every day away from the air means more hours in it to reach my goal. At 25 hours with the last 10 spread out over months, I am making little progress toward my solo. A big, big milestone birthday approaches. My two-year goal to solo on or near it was dashed by family medical problems that led me to be a caregiver instead of a flight-taker. (My practical daughter suggested that perhaps I should not fly because her father needed me, and what if something happened? I suggested that, well, I could just take him up with me. “That works,” she said.) 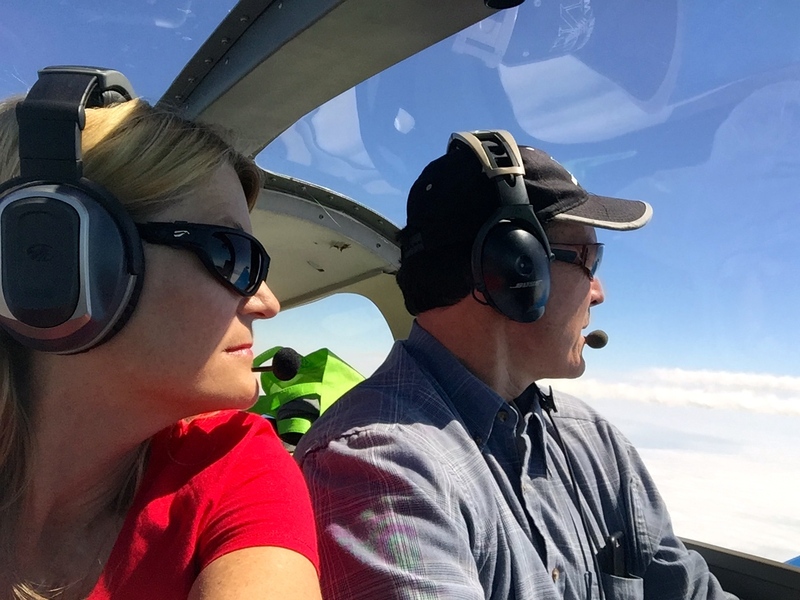 My husband came in the airplane with me a few times, but he would rather stay at home, as riding in small airplanes makes him airsick. Weeks passed. Months passed. I have forgotten half of what I learned. 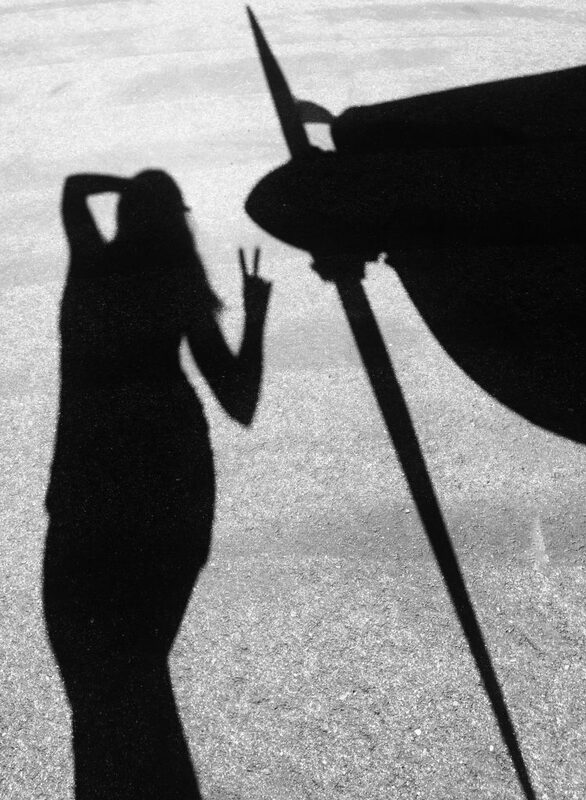 Got…to…get…up in the air…in a small airplane. My most recent flight instructor agreed to take me up a couple of weeks ago. It was a constant speed propeller plane, one that had extra items to attend to. It had been eight months since I had flown, and it showed. He did most of the work that day. We did do go-arounds to practice landings at a nearby airfield. Now, a week later, my birthday loomed, and I had to take to the air. Jerry agreed to take me up again. With the review the week before, some basics had began to come back to me. I certainly feel more comfortable in the left seat of any airplane with a trusty CFI by my side. My birthday is near Halloween, so scary stuff comes out all the time anyway. Scary it was to have to review so much when I was getting so close to solo nearly two years ago. Taking a deep breath on a clear, blue morning at our house, I head to the airfield. Only as I get close do I see fog hanging about. Jerry calls. Farther west the fog is so thick he is sure that it is not a flyable day. He wants to know how long I am willing to wait it out for the top of the nearby butte to be visible for the needed ceiling. It is my birthday; not only do I have all day, but I have arranged for a very special gift from my husband. You see, we live in a clearing in a forest on a ridge. Eighteen months ago we had 17 100-foot Douglas fir trees cut down. In the winter we now have sun in some windows. Yet there was one tree at the end of a row near our pond that I thought needed to be removed to enhance our view. “Honey, how about if you cut down that fir tree for my birthday gift while I fly over it?” He rolls his eyes. He agrees. Earlier in the morning that I am headed to the Lebanon airport for my flight, he had already finished the undercut and started the backside cut. This tree had to come down this day on purpose before the wind came up and it came down on its own. Yes, I would wait until too dark for that fog to clear for my flight over our house. We wait out the fog. It lifts, and no one was scheduled for that Cessna 172 anyway. We take off and head over to my property. Since it was my special day, I asked Jerry to do as little as possible and just tell me what to do. And we were flying the older, simpler (and cheaper) airplane. As the airplane approaches our property, my husband cuts the last bit of trunk and sure enough, I see the tree fall while in the air. Certainly a unique event for a seventieth birthday. Are you interested in learning to fly? Sign up for a free student trial membership in the Aircraft Owners and Pilots Association and receive six free issues of Flight Training magazine plus lots of training tools and resources for student pilots. Click here for more information.